With the recent economic downturn, homeowners are certainly examining their budgets closely, but that doesn’t mean they’re not spending money. One trend that is emerging is the popularity of outdoor kitchens. A new term has even been added to the American vernacular, “staycation”. Families are opting out of expensive vacations, and are instead aiming their budgets in their own backyards, including outdoor kitchens. The outdoor kitchen trend seems to be continuing at a healthy pace. Remodelers, kitchen and bath companies, and general contractors all have to find new ways to grow their businesses in a tough economy. For many, outdoor kitchens are the answer. And with so many new perspectives on how to create an outdoor kitchen, the rules keep changing. From brick pizza ovens, to wine coolers, water features and bars, the ever growing outdoor kitchen market is a place for innovation as well as new business opportunities. Just visit next home show in your area and you are bound to see a new outdoor kitchen company offering something you have never even seen before. 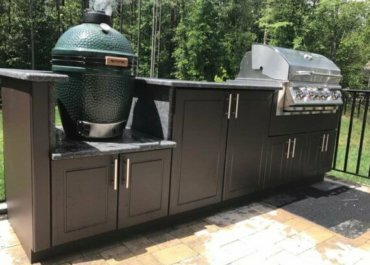 New entrants into the outdoor kitchen industry can showcase their ideas while helping to develop a new market, one that home owners can’t wait to show-off at their next party.